If you display at Maker Faires or other conferences, giving out stickers, buttons, or other memorabilia is a great way to help people remember you. Of course, it takes seconds of your precious time to either hand out or arrange so attendees can just grab one themselves. This wasn’t “efficient” enough for me, so I spent countless hours to design and build an automated dispenser robot. While “robot” here might be a bit of an exaggeration, the device does work automatically, dropping a button down a slide when someone places a finger inside the designated area. Instead of external buttons, one’s finger is picked from below the dispenser’s base using a TTP223B capacitive input module. The onboard Arduino Uno then starts a sequence where the bottom servo moves out of position to drop a single button, while the top servo “blade” holds the other buttons in place. 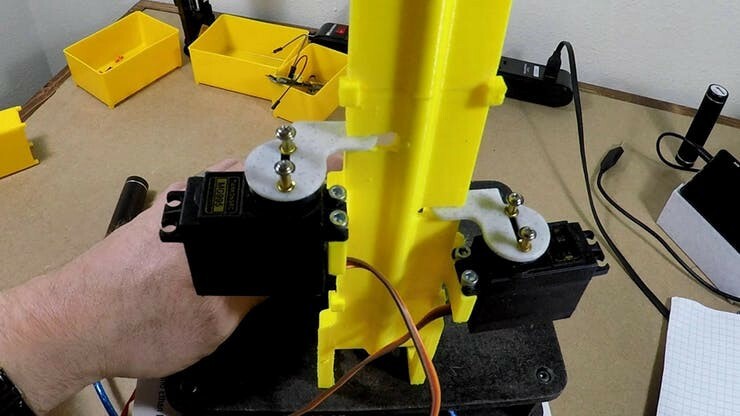 This blade-escapement method works quite well, and when the button drops, it hits a curve at the bottom of the 3D-printed fixture, launching it toward the operator. As seen in the video below, the initial intent here was to use a series of magnets in the same sort of orientation, though this presented problems when more than a few buttons were used. Button Dispenser Automates Maker Faire Display was originally published in Hackster Blog on Medium, where people are continuing the conversation by highlighting and responding to this story.